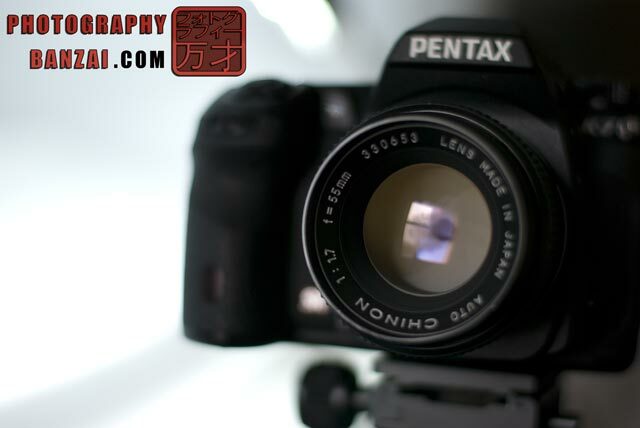 Home > Article > Experiment: Do older wide aperture lenses have issues with CMOS cameras? Experiment: Do older wide aperture lenses have issues with CMOS cameras? To follow up on my article here about the possibility that camera manufacturers are upping ISO behind the scenes with older wide aperture lenses, I attempted to do a test with two of my lenses and the two camera bodies I have. 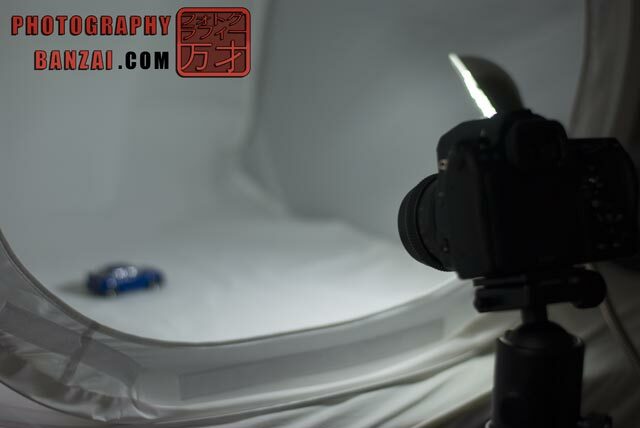 – Daylight with a single 20-LED lamp for lighting and a toy car as the subject inside a light tent. – I took photos with each lens on each camera using the widest respective aperture (1/100s, ISO 200) and f8 (1/8s, ISO 200) with custom white balance by allowing the camera to take a test image. – I had to slightly rearrange the K-7 to focus on the same spot due to the differences in camera body shape. – I used the application Rawstudio to generate 16-bit TIFF files from the DNG images I took. From there I opened the images in Photoshop CS2 and applied “Auto Color” due to the images from Rawstudio being dark without any camera specific modifications to the raw data like Photoshop would apply automatically. My main reasoning for applying that was to stretch out the data for the histogram and give all images a uniform color. I took screenshots of all histogram data for each image and pieced everything together to make things easier to interpret. I don’t see any data from the images themselves to make any conclusions. When applying auto color both sets of image output look quite similar. 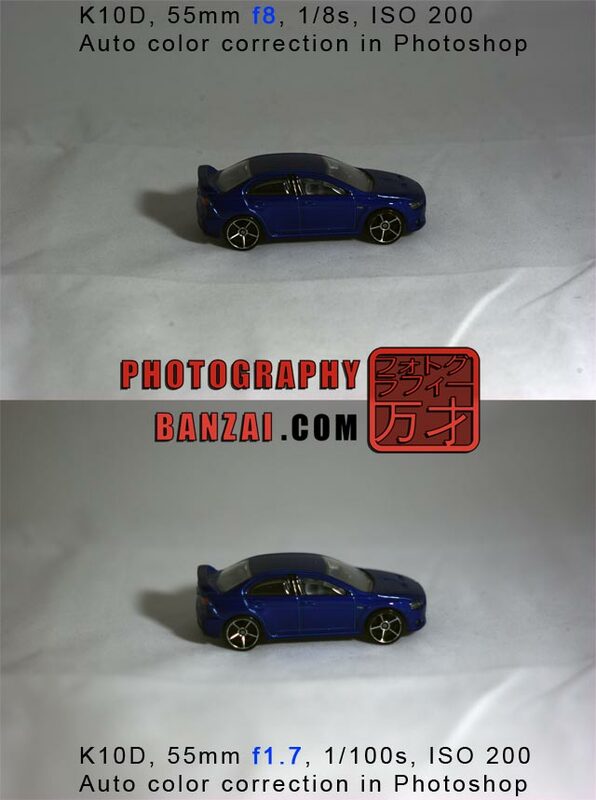 I do notice a thinner depth of field with the K-7 50mm image compared to the K10D image and it appears to translate over to the Chinon 55mm as well (take note of the blur quality and thickness around the toy car). While thinner DOF, the K-7 seems to produce sharper in-focus areas. That being said, it’s possible the slightly different angle or point of focus between camera bodies could be causing the effect. There is quite a bit of interesting data there. First off, the K-7 is producing an un-uniform line (aka. “choppy histogram”) compared to the K10D. The effect is more pronounced with the Chinon 55mm than the FA50mm. Could this be an issue CMOS sensors have with older wide aperture lenses compared to CCDs? The auto color algorithm stretches out the data (16-bit in this case), so we see gaps form in the K-7 image where the transition between levels of brightness jumps considerably. From my research having a choppy histogram means the image is becoming “posterized” with less gradual tones throughout the image. 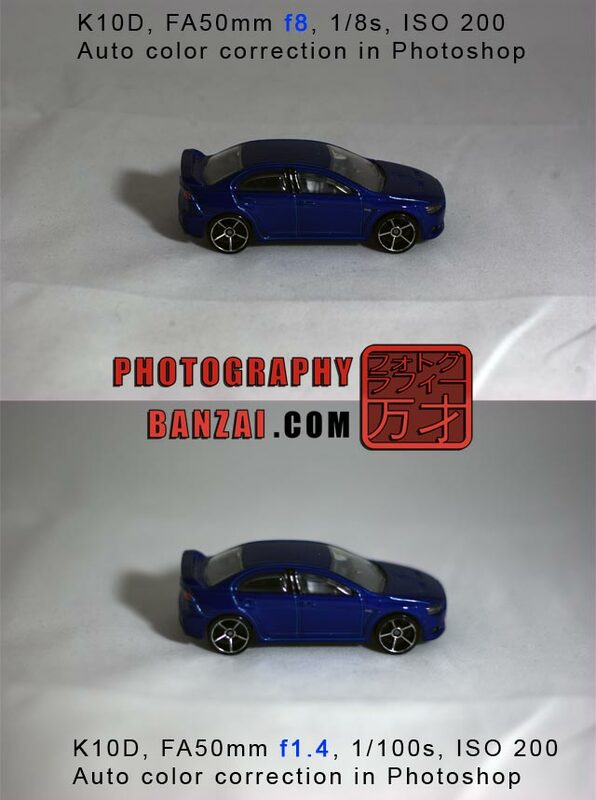 Without correction in software, the posterization issue might suggest the K-7 is somehow overexposing the image even with the same manual settings. Besides posterization, The Chinon and FA 50mm seem to have the same amount (shape) of dynamic range between camera bodies, but the K-7 looks to be able to produce more contrast in the image due to “fatter tops” on the “mountains” in the histograms. Overall the camera bodies seem similar enough in actual results to call it a draw. While the histogram results seem interesting I can’t personally say if camera companies are cooking the ISO setting on their cameras when an older wide aperture lens is being used. The sensors are obviously different and record images in their own respective ways, so I think results here are within those differences. I’ll leave the conclusions to the people who have more technical knowledge. This entry was posted in Article, General and tagged ccd, cmos, experiment, gaming, iso, issues, light falloff, old lens, wide aperture. Bookmark the permalink.